Get ready for some serious to-die-for cream cheese fruit tart. This is a recipe my SIL made for one of our tea parties. 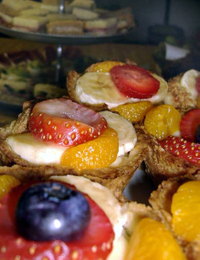 For these tarts, B used a basic pastry recipe for the crust, pressed into cupcake tins. The shape of the crust is irregular when you do it this way, but unless you're fussy about scalloped edges, a rough edge has its own appeal. This cream cheese filling could also go well with a cookie type tart crust (go here for more crust ideas). Cream butter and sugar together until fluffy. Add flour, salt and vanilla and beat together. Separate into 2-3 inch balls and press into cupcake tins. Beat all ingredients together. Spoon into cupcake tins, but don't fill all the way to the top. Bake at 375° for 10-15 minutes, until crust is golden brown. Allow to cool. Top with thinly sliced pieces of fruit: bananas, strawberries, mandarin oranges, kiwi, cherries, blueberries, rasberries, etc. How many does this recipe make? And is the crust mix supposed to be crumbly? Thank You! I have been looking for a recipe like this one to make for an upcoming brunch that I am hosting! I am excited! My word these look divine. Gotta try these. Yum! I love cream cheese ...and in tarts? Look out! I posted a Key Lime Tart just the other day....Tarts - love them, love them, love them! 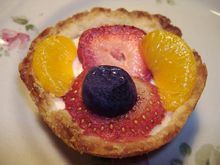 Wonderful recipe..I love cream cheese tarts.